Having lived in Albuquerque for 10 years – their local Green Chile somehow becomes a part of you – something you miss very much when you move away. Thankfully, I found frozen Hatch Green Chile from Select New Mexico at my local Wal-Mart the other day and proceeded to make the absolute BEST Vegan Green Chile Stew I ever had. And I did it in my Instant Pot Pressure Cooker! From the Facebook Groups, I see many of you have purchased Instant Pot Pressure Cookers lately….. And if you haven’t actually tried them out yet – they are EASY to use! Saute – add liquid, pop on the lid, and set the timer. Bam – instant dinner. And in this case – instant deliciousness. 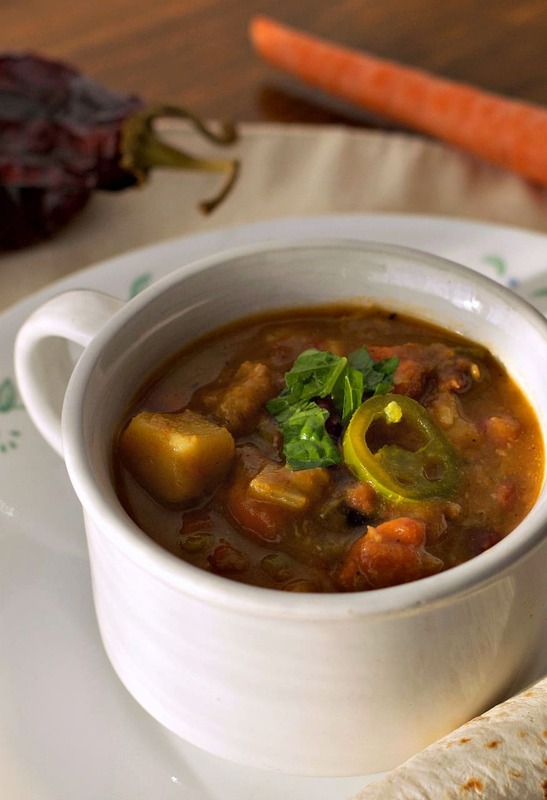 I consider myself somewhat of a Vegan Green Chile Stew connoisseur …..and let me tell you this is GOOD!. And I have my local Wal-Mart to thank. You see I was shopping the other day and spied THIS in the frozen veggie cooler…. It’s a 24oz bag of frozen Hatch Green Chile…..in OREGON! Don’t let the HOT label scare you. I found very little heat – barely more than those little cans you buy in the grocery store. But the FLAVOR! Oh man – this is the real deal! So if you’re looking for a Mexican Soup recipe to warm your bones on a cold winter day – and you have an Instant Pot sitting there on your counter…..
You HAVE GOT to try this stew. Your spicy food loving spouses will absolutely LOVE it. 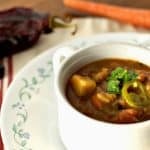 Traditional New Mexican Green Chile Stew uses pork. But this is a VEGAN MEAT-FREE RECIPE – so I included options to add meat-substitutes if you want them. But just know it can easily be made without any meat substitute at all….. just add the spices to the broth. So if you DO use a substitute – here are a few options. Butler Soy Curls will give you more of a ‘shredded pork’ texture which perfectly compliments Vegan Green Chile Stew. Seitan – either store-bought or homemade will give you more of a ‘chunky’ beef texture. GimmeLean Sausage from LightLife Foods comes in a tube and will give you a ground beef texture. Portabello Mushrooms are more of a natural alternative – and can be used in place of any ‘fake meat’. Whatever you use – you want enough to mimic about 1 lb of hamburger. So use an entire tube of GimmeLean, ½ bag of Soy Curls, 16oz Mushrooms, etc. If using Soy Curls – rehydrate with water first and then add spices while browning. Add broth as needed. If using mushrooms, seitan, or the GimmeLean – add the spices to a little water/beg broth while you saute. If using no meat substitute at all – add the spices later to the broth before pressure cooking. Add Veggie broth or water to keep things from sticking – but remember any browned bits stuck to the bottom add to the flavor. Once your ‘meat’ has been browned using the SAUTE and LESS mode of your IP, remove it to a separate bowl. Saute 1 diced yellow onion, 2 chopped carrots, and 2 chopped stalks of celery in a little broth or water until softened. Then add 4 or 5 cloves of minced garlic. Stir for 1 minute and then add 2 cups of veggie broth. Be sure and scrape around the bottom good to removed any browned bits that might have stuck. Then add the remaining water. Add the spices at this point if you did not use any meat, then add 1 tsp of Oregano. Finally, add 1 cup of dried Pinto Beans. I picked over them first and gave them a good rinse, them just dumped them in. No soaking required. Attach your lid – make sure the valve is set to SEALING, and set your mode switch to MANUAL. We want to pressure cook the broth and beans for 30 minutes. Afterwards, allow the IP to vent naturally for about 10 minutes and then CAREFULLY release the remaining steam. Open the lid and give the stew a good stir. Add 3 cubed Yukon Gold Potatoes, 1 can of Fire Roasted Tomatoes, the ‘meat’ you set aside earlier (if using), and the entire 24oz bag of thawed Green Chile. Mix well, add the lid again, make sure it’s set back to SEALING, and cook on MANUAL for an additional 8 minutes. When the time is up, allow it to naturally vent for 5 minutes and then CAREFULLY release the remaining steam. Finally, stir in ¼ cup of Lime Juice, and a Tablespoon or 2 of Masa Harina Corn Flour. Just sprinkle it on top of the stew and stir it in to thicken. I used 3 Tbs for my batch so it shouldn’t take more than that. Vegan Green Chile Stew in a Pressure Cooker. My wife says it tastes VERY authentic to New Mexico. (only without any meat or oil). Enjoy and if you have an IP you haven’t used yet – break it out! Frozen Hatch Green Chiles make this Vegan Green Chile Stew a snap - especially when you make it in an Instant Pot. So full of flavor! Pass the tortillas! Sauce your 'meat' of choice using the SAUTE MODE and LESS setting of your IP. Did you try Target? Otherwise see if you can find the Bueno brand of Frozen Green Chile. If not, maybe try a Whole Foods or Trader Joes if you have one nearby. Otherwise, you can always use canned, but the flavor will not be nearly as good unless you can find Hatch. You’ll need 2-3 cups of chopped Green Chile. Aside from the hot (which again I did personally like), this stew was amazing!!!! It is as close to the real deal as I’ve ever made/had since going plant-based. I made it with store-bought seitan. I told my husband if we could eat this every week, it still wouldn’t be frequent enough. How would you adapt this for either regular cooking or a slow cooker? Thanks, Chuck ! Could you please tell me which Walmart you found the chiles in? I’m in north Portland and looking. Thank you. The one in Cornelius/Forest Grove. I just had a question about the prep and cooking in the initial steps of this recipe: Is it really necessary to saute the veggies and spices (and optional meat) in two separate stages in the beginning? I am always looking for easy “throw it all together and cook it” type recipes especially with my new IP. So I was wondering if you tried just skipping the separate stages, and threw the beans in with all the broth & meat ingredients and cooked it all together, then added the stew veggies (potatoes, tomatoes, green chilies) when recommended above, and whether it made a huge difference in taste? My hubs and I were wondering if Tofu could be used in this recipe? The instructions do not say when to put in the salt and pepper. Does it go in and cook with the beans or added afterwards with the lime juice? Thanks for the recipe! Do you think this would freeze well?